In 1879 Rudolph Lindt invited the cocoa conche when he left his milling machine running overnight. The smooth glossy cocoa that resulted made him develop the modern milling process chocolate manufacturers use today to grind cocoa beans. 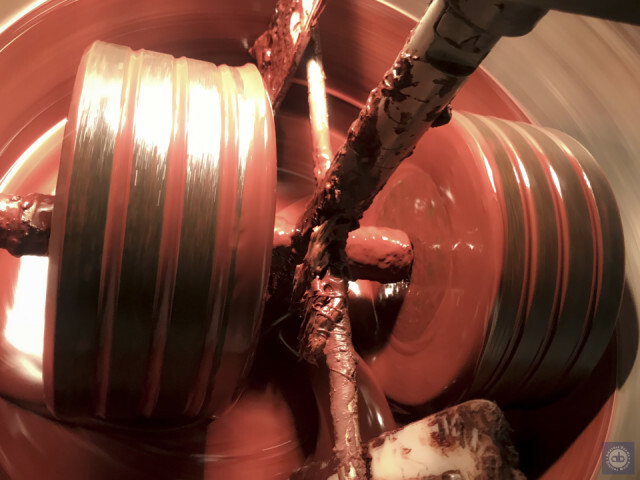 By using this process it is then possible to produce solid chocolate (Before this, it was only a drink). Here is one running at Hotel Chocolate in Covent Garden where we were treated to a guided tour of the chocolate making process. Though work ... but it has to be done!